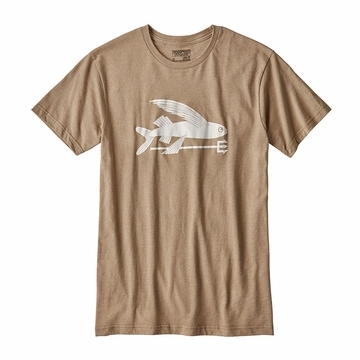 This slim-fitting tee is made from a soft, heathered 50/50 fabric blend of U.S.-grown organic cotton/postconsumer recycled polyester, and features original art by Geoff McFetridge thats screen-printed with PVC- and phthalate-free inks. Those who say fish cant fly probably say they cant hunt, either. We know better. The Flying Fish Cotton/Poly T-Shirt features original artwork by Geoff McFetridge thats screen-printed on an exceptionally soft fabric blend of postconsumer recycled polyester and Texas co-op organic cotton. Screen-print inks are PVC- and phthalate-free. Taped shoulder seams for comfort and fit retention. Sturdy side seams keep garment from twisting and shrinking when washed.